The accelerating pace of technological, demographic and socio-economic disruption is transforming industries and business models, changing the skills that employers need and shortening the shelf-life of employees’ existing skill sets in the process. For example, technological disruptions such as robotics and machine learning—rather than completely replacing existing occupations and job categories—are likely to substitute specific tasks previously carried out as part of these jobs, freeing workers up to focus on new tasks and leading to rapidly changing core skill sets in these occupations.11Even those jobs that are less directly affected by technological change and have a largely stable employment outlook—say, marketing or supply chain professionals targeting a new demographic in an emerging market—may require very different skill sets just a few years from now as the ecosystems within which they operate change. In this new environment, business model change often translates to skill set disruption almost simultaneously and with only a minimal time lag (Figure 8A). Our respondents report that a tangible impact of many of these disruptions on the adequacy of employees’ existing skill sets can already be felt in a wide range of jobs and industries today (Figure 8B). For example, current technological trends are bringing about an unprecedented rate of change in the core curriculum content of many academic fields, with nearly 50% of subject knowledge acquired during the first year of a four-year technical degree outdated by the time students graduate, according to one popular estimate.13A focus on the state of the talent pipeline for traditional formal qualifications and ‘hard skills therefore risks dramatically understating the scale of impending skill set disruption if a large part of the existing subject knowledge of the current workforce will be outdated in just a few years. There are various reasons for such dramatic shifts in expected skills requirements. As noted earlier, in the face of rapidly rising computing power, an ability to work with data and make data-based decisions will become an increasingly vital skill across many job families as employers scramble to build a workforce with solid skills in data analysis and presentation (e.g. through visualization) and the amount of potentially useful digital information generated and stored keeps increasing exponentially. In the Consumer sector, for example, vast amounts of data will allow for increased sophistication in inventory management, customer segmentation and product personalization, involving some use and familiarity with technology by jobs at all levels, from retail assistant through to more senior positions. Businesses in industry sectors such as Mobility, Energy, Financial Services & Investors and Information and Communication Technology are increasingly finding themselves confronted with new consumer concerns about issues such as carbon footprints, food safety, labour standards and privacy. From a skills perspective, they will need to learn to more quickly anticipate these new consumer values, to translate them into product offerings and to become ever more knowledgeable about the processes involved in meeting these demands and the impact this may have on their employees’ current skill sets and working practices. While most jobs require use of a wide range of skills, somewhat different skill set combinations are sought after in different industry sectors. Our dataset allows us some generalized observations about the impact of various disruptive changes on skills demand at an aggregate industry level. 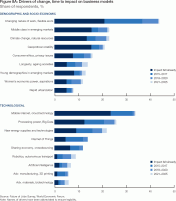 With regard to the overall scale of demand for various skills in 2020, more than one third (36%) of all jobs across all industries are expected by our respondents to require complex problem-solving as one of their core skills, compared to less than 1 in 20 jobs (4%) that will have a core requirement for physical abilities such as physical strength or dexterity. 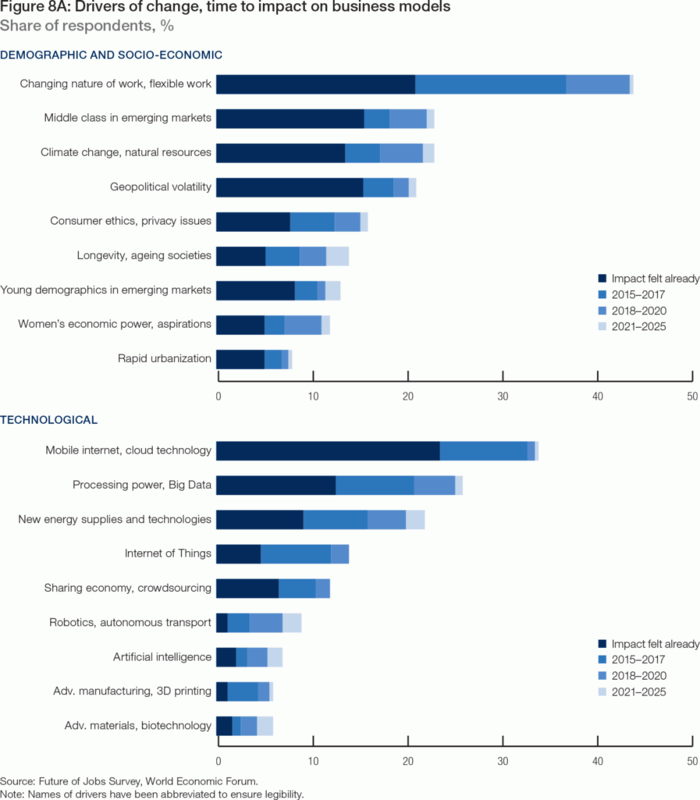 However, along with the impact of disruptive changes on these sectors, it is anticipated that complex problem solving skills will become somewhat less important in industries that are heavily technical today—such as Basic and Infrastructure and Energy—in which technology may automate and take on a bigger part of these complex tasks going forward, and will ascend in those industries, such as Professional Services and Information and Communication Technology, that are expected to become more complex and analytical due to these trends. Overall, social skills—such as persuasion, emotional intelligence and teaching others—will be in higher demand across industries than narrow technical skills, such as programming or equipment operation and control. Content skills (which include ICT literacy and active learning), cognitive abilities (such as creativity and mathematical reasoning) and process skills (such as active listening and critical thinking) will be a growing part of the core skills requirements for many industries. If skills demand is evolving rapidly at an aggregate industry level, the degree of changing skills requirements within individual job families and occupations is even more pronounced (Figure 10). For example, the increasing ubiquity of mobile internet combined with the coming-of-age of the Internet of Things promises to transform the daily routine of many frontline roles in the Sales and Related, Installation and Maintenance, and Manufacturing and Production job families across all industries, requiring a much higher level of technology literacy than in the past. As an ancillary characteristic to increased automation in these fields, employees are expected to have more responsibilities related to equipment control and maintenance and problem-solving skills, as well as a broader general understanding of the work processes of their company or organization. Many formerly purely technical occupations are expected to show a new demand for creative and interpersonal skills. For healthcare practitioners, for example, technological innovations will allow for increasing automation of diagnosis and personalization of treatments, redefining many medical roles towards translating and communicating this data effectively to patients. Similarly, Sales and Related jobs may see an increased demand for creative skills and ideas for promoting a memorable shopping experience, as brick-and-mortar retail has to reposition itself in relation to e-commerce and online competition. Overall, our respondents anticipate that a wide range of occupations will require a higher degree of cognitive abilities—such as creativity, logical reasoning and problem sensitivity—as part of their core skill set. 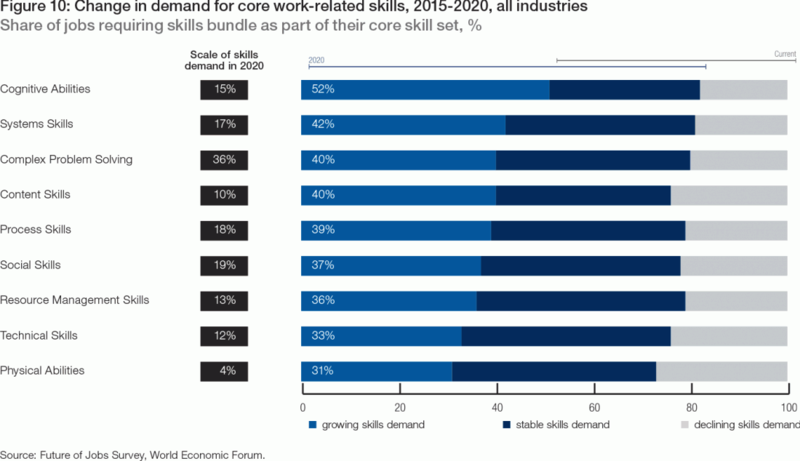 More than half (52%, the bright blue part of the bar in Figure 10) of all jobs expected to require these cognitive abilities as part of their core skill set in 2020 do not yet do so today, or only to a much smaller extent. 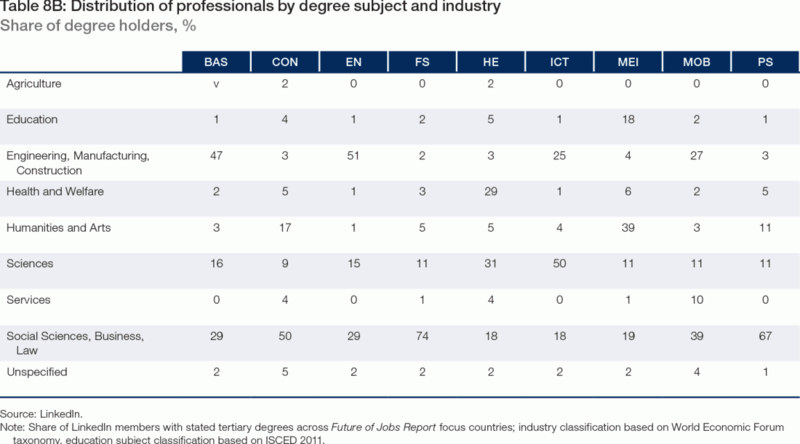 In another 30% of jobs (the dark blue part of the bar in Figure 10), demand for these skills is currently already high and will remain so over the 2015–2020 period. Only 18% of jobs requiring high cognitive skills today are expected to do so less in the future (the grey part of the bar in Figure 10). At the other end of the scale, among all jobs requiring physical abilities less than one third (31%) are expected to have a growing demand for these in the future, about as many as the proportion of jobs in which physical abilities are anticipated to decline in importance (27%). The skills bundle with the most stable demand across all jobs requiring these skills today or in the future are technical skills: nearly half (44%) of all jobs requiring these skills today will have a stable need for them in the coming years. Today’s job markets and in-demand skills are vastly different than the ones of 10 or even five years ago, and—as demonstrated in this Report—the pace of change is only set to accelerate. Governments, businesses and individuals alike are increasingly concerned with identifying and forecasting skills that are relevant not just today but that will remain or become so in the future to meet business demands for talent and enable those that possess them to seize emerging opportunities. 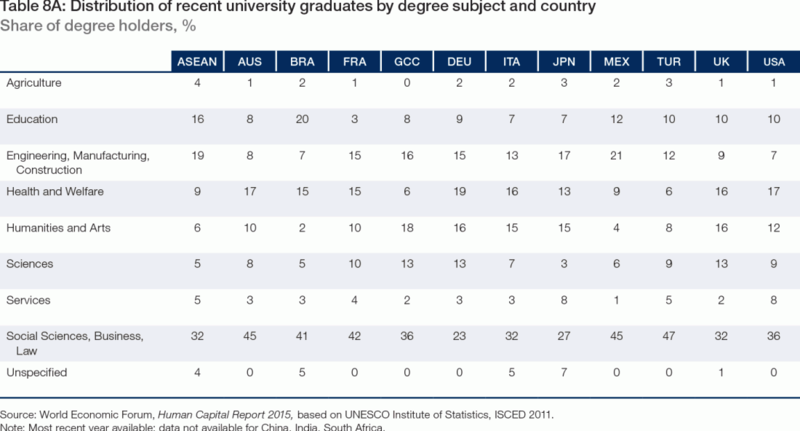 In light of technological trends such as the ones outlined in this Report, in recent years many countries have undertaken significant efforts to increase the amount of STEM (science, technology, engineering and mathematics) graduates produced by their national education systems (Table 8A). While the employment trends identified by this Report certainly corroborate the importance of these efforts, it is nevertheless also clear that the potential net job creation in absolute terms in the STEM field alone will not be sufficient to absorb strains on other parts of the labour market. What we have found instead is that disruptive changes will have a significant impact on skills requirements in all job families and that they are creating a range of opportunities and challenges in all industries, not just narrowly related to ‘hard knowledge’, technical skills and technology. In order to manage these trends successfully, there is a need for potentially reskilling and upskilling talent from varied academic backgrounds in all industries (Table 8B). Skills mismatches may therefore emerge not just between the supply and demand of existing skills today, but also between today’s skills base and future skills requirements. Efforts aimed at closing the skills gap will increasingly need to be grounded in a solid understanding of a country’s or industry’s skills base today and of changing future skills requirements due to disruptive change. For example, efforts to place unemployed youth in apprenticeships in certain job categories through targeted skills training may be self-defeating if skills requirements in that job category are likely to be drastically different in just a few years’ time. Indeed, in some cases such efforts may be more successful if they disregard current labour market demands and past trends and instead base their models on future expectations. 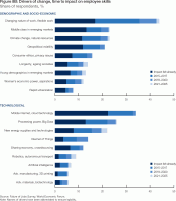 Across industries, geographies and job families, an ability to understand the current skills base in near-real time and to accurately forecast, anticipate and prepare for future job contents and skills requirements will be increasingly critical for businesses, labour market policymakers, workers’ organizations and individuals to succeed. Drivers of change to job markets such as Big Data analytics may themselves become useful tools in managing this process. 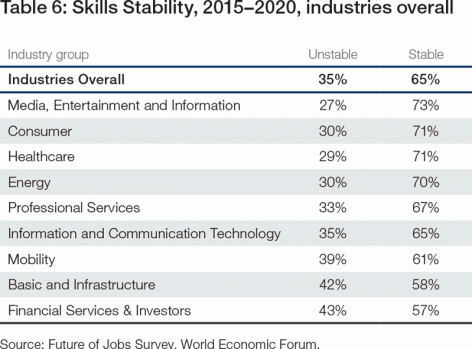 Job requirements and skills profiles are rapidly changing. Yet when it comes to the traditional tools policymakers and employers have at their disposal to navigate this change there often is a time lag of months, if not years, until updated information becomes available. Growing computing power and large amounts of data are increasingly making it possible to understand and anticipate changes in labour markets in near-real time, and to re-shape education and training policies in a timelier manner to help narrow the widening skills gap. For example, hundreds of millions of workers across the globe have added their professional information—including their education, skills, and past and present jobs—to online talent platforms such as LinkedIn, affording these providers with unique insights into changing skills supply. Increased collaboration between stakeholders such as online talent platforms, human resources consulting firms, employers, policymakers, labour unions and education providers, has the potential to substantially improve the speed and precision of future workforce planning and managing organizational change. In order to map labour market changes, LinkedIn’s analytics describe each job function as an agglomeration of skills, enabling the platform to nowcast changes in the skills landscape as members update their professional information. This enables the platform to identify clusters of skills that are particularly associated with the profiles of members with common job functions and titles and to map how these change over time. It also allows for identifying nuances and differences between the skill sets of common job functions in different industries or geographies. 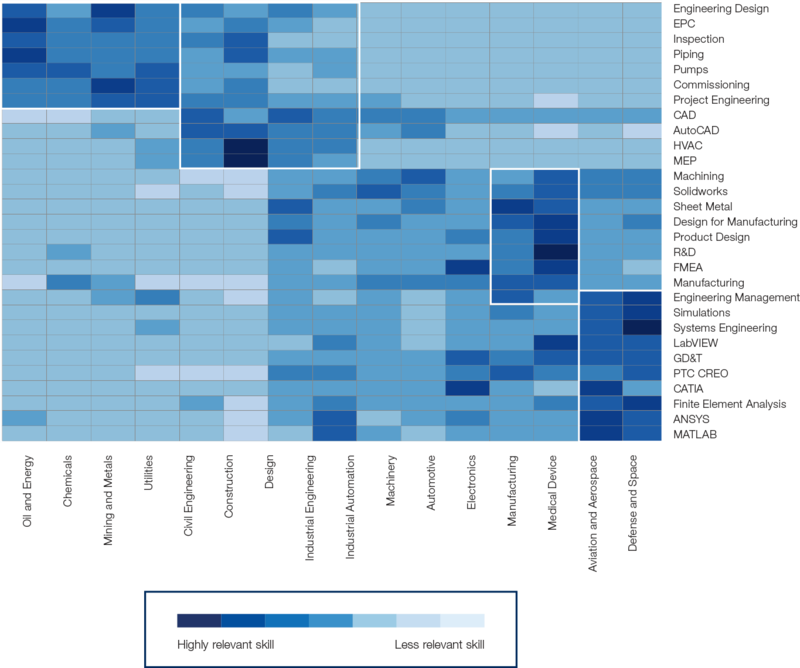 For example, the heatmap below shows how the most common skills reported by mechanical engineers vary across different industries. The dark blue color in area 1 in the chart below shows that mechanical engineers working in various sectors of the Mobility industry have similar skills. It also shows that their skills differ from the skills of mechanical engineers who work in the Healthcare industry (area 2) or the Energy and Basic and Infrastructure sectors (areas 3 and 4). By tracking skills that were recently added to members’ profiles as a percentage of those who already reported that skill, it becomes possible to identify skills whose supply is on the rise in particular industries or geographies. This supply-side analysis can be complemented with analysis of skills demand—whether based on job listings, within-job hiring rates, governmental forecasts, or employer surveys such as the one presented in this Report—to identify emerging skills gaps and inform training and skills programmes to prepare the workforce for future requirements. At the national level, countries experience varying inflows and outflows of talent over time. Outflows and inflows of talent often do not have the same skills compositions, resulting in a correlation between talent mobility and changing skills gaps across countries and over time. The Country and Regional Profiles in Part 2 of the Report highlight the current and expected share of strategic and specialist job functions anticipated by respondents from the corresponding industry to be recruited locally in the country. A very low local recruitment share may indicate skills shortages and a very high reliance on expatriate talent. A very high local recruitment share might indicate underutilized opportunities to diversify experience and increase knowledge transfer to the local workforce from internationally mobile experts. On the supply side, by tracking members’ profile changes with regard to their home geography, the LinkedIn platform can track the rate at which countries are losing or gaining particular in-demand skills.1 Data on both demand and supply is critical for informed decision making on talent mobility policies. 1 State, B., M. Rodriguez, et. al., “Migration of Professionals to the US: Evidence From LinkedIn Data”, Social Informatics, pp. 531–543, 2014. 11 See, for example: Chui, Michael, James Manyika and Mehdi Miremadi, “Four fundamentals of workplace automation,” McKinsey Quarterly, November 2015; and Cognizant, The Robot and I: How New Digital Technologies Are Making Smart People and Businesses Smarter by Automating Rote Work, Cognizant Center for the Future of Work, 2015. 12 See: Infosys, Amplifying human potential: Education and skills for the fourth industrial revolution, 2016. 13 McLeod, Scott and Karl Fisch, “Shift Happens”, https://shifthappens.wikispaces.com. 14 Bessen, James, “Employers Aren’t Just Whining – the “Skills Gap” Is Real”, Harvard Business Review, 14 August 25, https://hbr.org/2014/08/employers-arent-just-whining-the-skills-gap-is-real. 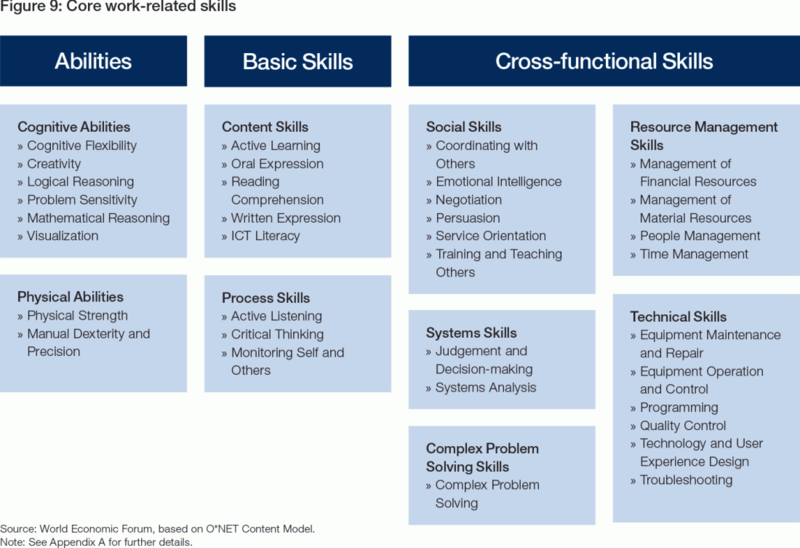 15 Our empirical analysis of the O*NET Content Model found that the core skill set of most occupations consists of a range of combinations of these 35 core skills and abilities, in addition to occupation-specific specialist knowledge. Note that, unlike for occupations, a widely agreed or internationally comparable definition or taxonomy of the term ‘skills’ does not exist (see, for example: European Training Foundation Anticipating and Matching Skills Demand and Supply: Synthesis of National Reports, 2012). For details of the Report’s adaption of O*NET’s work-relevant core skills please refer to Appendix A: Report Methodology. 16 For details of the methodology used in this section, please refer to Appendix A. 17 Also see: World Economic Forum and the Global Agenda Council on Employment, Matching Skills and Labour Market Needs: Building Social Partnerships for Better Skills and Better Jobs, 2014.